This species is found in deeper water in small shoals. A biotope aquarium would consist of a sandy substrate with driftwood roots and branches. Algal growth should not be discouraged. If kept in a planted aquarium, any soft-leaved varieties will be eaten and even the tougher species will be picked at. Water flow should be quite strong. A well-fitting cover is essential as Pseudanos are excellent jumpers. Though it is omnivorous, this species is primarily a herbivore. Offer live and frozen foods as well as plenty of vegetable matter in the form of blanched spinach, lettuce, cucumber, courgette, algae wafers etc. 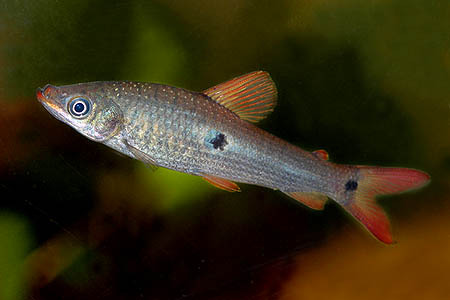 Aggressive towards its own kind when kept in small numbers, it can be maintained in groups of 6 fish or more in larger aquaria. Otherwise, keep as a single specimen in a community of medium to large fish. Suitable choices include larger characins (but not other Anostomids), Loricariids, Doradids, peaceful Cichlids, knifefish, Corydoras etc. It may nip at long-finned fish, especially slow-moving species. This species was formerly known as Anostomus trimaculatus and this name is still used in much of the available literature. It is now invalid, however. The genus Pseudanos contains 3 other known species, P. gracilis, P. irinae and the recently described P. winterbottomi. Care for these species is as for P. trimaculatus.